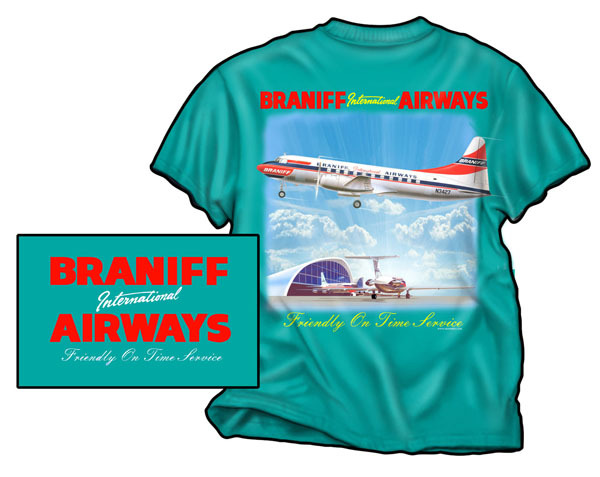 Our brand new two-sided Braniff Convair shirt was printed with a few on a very attractive Jade colored shirt. It is like the regular version, the only difference is the shirt color. It has the Braniff Convair on the back taking off, with the airport terminal in the background featuring a BAC 111 and a 707. Priced to sell! Sizes M, Large and XL only.